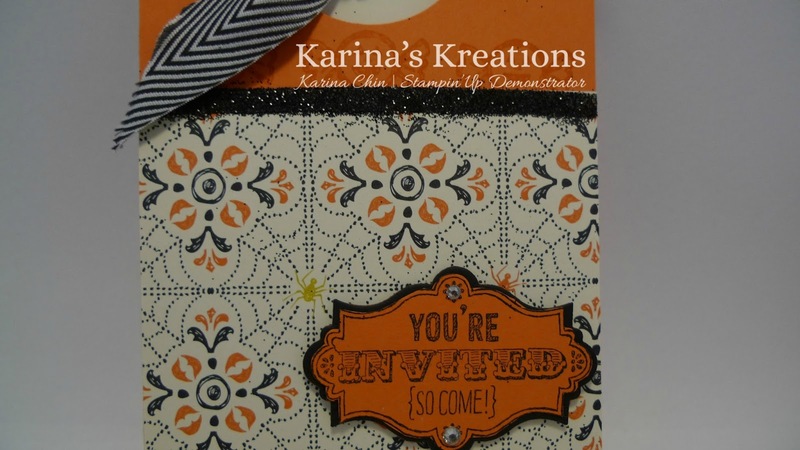 Karina's Kreations: Halloween Hello Invite! I've been playing with my new product from the holiday mini catty and having so much fun!!! I made a "celebrate" banner last night with the new Banner kit #133507 $24.95 and have to finish the Halloween design so I can share it with you. In the mean time I came up with this super cute Halloween invite! You could use it for a Halloween party or I'm using it for my Halloween Banner class on Wednesday Sept 25th! Gather 7 friends and you can be the host for this girls night out!!! Email me at kchin2@telus.net if you're interested. My card base is 5-1/2 " x 8-1/2" scored at 4" and 1/2" on the 8-1/2" side. I closed the side with Sticky Strip and sealed the bottom of the card to make a pouch. I made an insert that is 3-3/4" x 5-3/8". I punched a hole and added the yummy 3/4" Basic Black Chevron Ribbon. I still have 2 shares left of this ribbon. It's only $34.00 for all the colors and you get 2 yards each!!! I love the Witches Brew Designer Series Paper #132185. It has a happy side and scary side!!! Make sure you order the Black & Orange Stampin' Glitter #132206 $9.95. I added a piece of sticky strip along my invite and rubbed the glitter into it. So quick & easy!! !